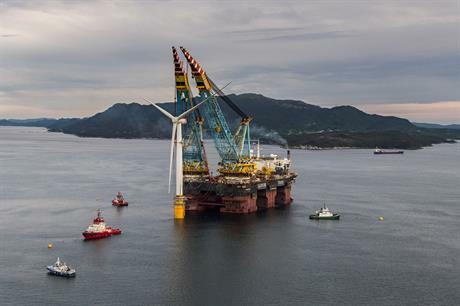 NORWAY/UK: The five turbines destined for Statoil's 30MW Hywind Scotland floating project have been installed on their spar buoy foundations and are ready for transport to the project site. 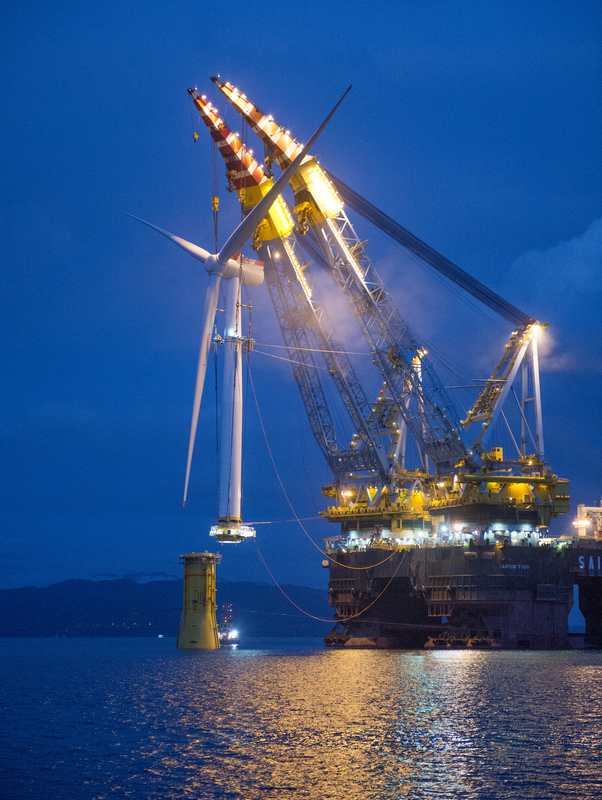 The five 6MW Siemens Gamesa Renewable Energy (SGRE) offshore wind turbines are now "mated" with their foundations at a site in Norway, a little over seven weeks after the first turbine was completed. Hywind Scotland is set to become the largest floating offshore project to-date when the machines are installed at the site 25km off the Peterhead coast, on the east of Scotland. First power is expected by the end of this year. Siemens-Gamesa (then just Siemens) previously supplied turbines to the Hywind Demo site in Norway in 2009. As a result of that project, the manufacturer said it has developed controller algorithms for rotor pitch and yaw drive regulation. The Hywind floating foundation is a spar-based design, made up of a steel cylinder filled with ballast. It extends approximately 80 metres below the surface and is attached to the seabed by a three-point mooring. The overall structure is set to be 258 metres long – from spar-base to maximum blade tip height. "Siemens Gamesa views the floating wind farm market area the same way as we did with offshore wind farms in the early beginning: it is a very interesting area that is initially a niche market. This niche may, however, develop over time into a large market. It is a niche in which we would like to build a strong position for this reason," said SGRE offshore CEO Michael Hannibal. Statoil is partnering with United Arab Emirates-based renewable energy firm Masdar on the project. It will become the world's first commercial floating wind project.